You are here: Home / How-tos / MBOX to Outlook converter tool review. MBOX to Outlook Converter tool developed by SysTools helps converting Thunderbird MBOX files to Outlook PST, EML and MSG formats. The tool performs batch processing on MBOX email files and converts them to multiple file formats without making any compromise with the quality and integrity of data. All the emails and embedded attachments remains intact while migration. For successful conversion from MBOX to Outlook PST, EML or MSG formats it is require to install the tool. After complete satisfaction, the activation key for licensed version of the product can be opted for by contacting the Technical Support team. The activation key is granted within 24 hours of making payment. Conversion of MBOX emails without negotiating with data. Conversion of all embedded attachments along with emails. Multiple MBOX emails conversion for saving time. Saving email messages in more organized manner. 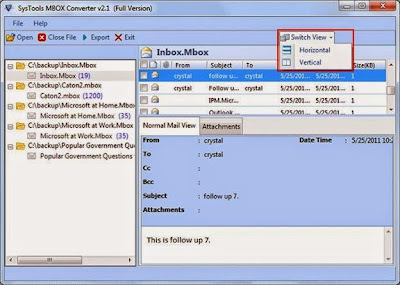 Split and Merge MBOX emails for enhanced search ability. Batch Processing of Files: Converts multiple MBOX files in single instance that results in saving time and efficient processing of files. Supports Multiple MBOX Formats: The tool supports multiple MBOX formats such as .mbox, .mbx, etc. along with MBOX files that are without extension. Offers Different Export Options: Performs conversion in three different formats including PST, EML and MSG supported by Outlook and multiple email clients. Saves as Single or Multiple PST Files: Offers to create one PST for multiple MBOX files or single PST for each/ individual MBOX file. Automatic Scanning of MBOX Files: Tool performs automatic scan on MBOX files while the file is selected to upload. Preview Emails with Attachments: All the emails along with embedded attachments can be viewed within the tool in ‘Normal Mail View’ and ‘Attachments’ tab. Easy to Switch View within Tool: Offers to switch between dual given options i.e., horizontal view or vertical view as per requirements. 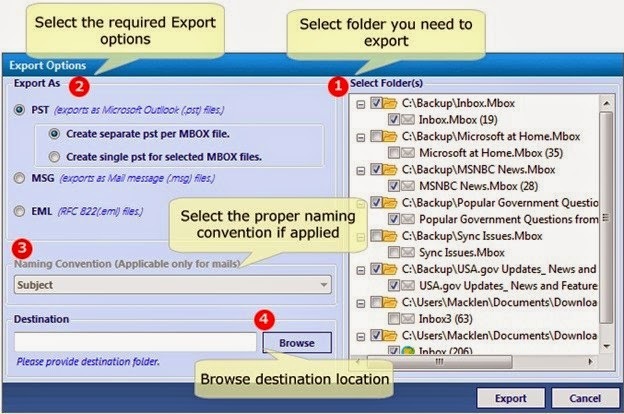 Availability of Multiple Export Options: The tool gives option to select multiple files or entire folders to be exported by selecting the associated checkboxes. Naming Convention for EML and MSG: If the MBOX emails are converted to EML or MSG formats, the tool gives the convenience to save them with appropriate names. Generates Export Report of Processed Files: The tool generates export report for all the executed files and saves it on machine for future reference. Converts Entourage emails to Outlook PST. Converts Thunderbird emails to PST files. Converts Eudora mails to Outlook supported formats. Converts Apple Mail to Outlook PST, MSG or EML. The tool does not affect the original files i.e., the structure of MBOX files remain intact. The tool will create new files and saves them at any desired location. Saving files in PST format provides accessibility in all versions of MS Outlook. Saving files in EML format offers accessibility of emails over multiple platforms. Naming Convention for EML and MSG improves search ability for emails. 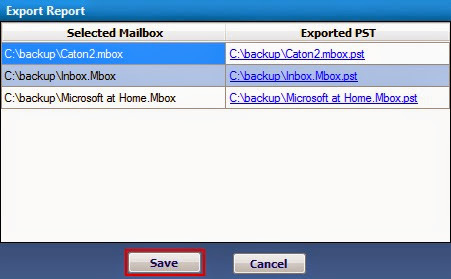 Single PST can be created for single email or multiple MBOX files. Saving emails in more defined and organized manner using EML and MSG. Offers cross platform accessibility such as Mac emails can be accessed on Windows. EML files are accessible over Internet Explorer, Firefox and Opera browsers. It does not provide option to split large PST files to smaller proportions for better manageability. The CSV file that saves Export Report should contain more information about exported files such as date and time details along with exported contents, etc. Emails saved in MBOX files are stored in a plain text format and if it is required to search for a particular email, thorough searching is required as the email messages are saved one after another in a single file. Converting these files in EML or MSG format makes it easier to search for the particular email message. 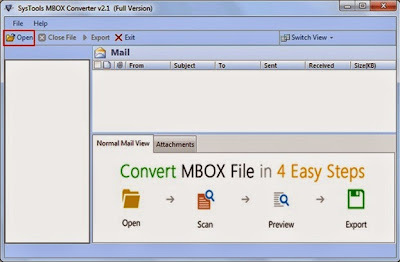 When MBOX files are converted to PST, EML and MSG format using MBOX Converter tool, it increases the accessibility of emails over multiple applications such as MS Outlook, Windows Live Mail, Pocomail, Apple Mail, Mozilla Thunderbird, Microsoft Entourage, IncrediMail, etc. Moreover MBOX to Outlook Converter tool is beneficial if Mac Operating System emails are required to view on Windows Operating System as it converts MBOX files to EML format.